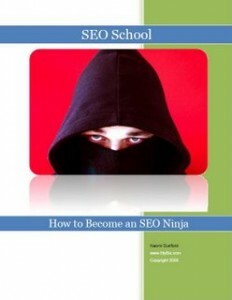 Actually the book is called: “How to become an SEO Ninja”. SEO (Search Engine Optimization) is the process of improving WEB site from point of view of search engines to bring more and better quality traffic. SEO act as marketing for the site to increase his relevancy using knowledge of methods how search engines work and what keywords people use to search. In Japanese history, a ninja was someone specially trained in a variety of unorthodox arts of war. The methods used by ninja included assassination, espionage, and a variety of martial arts. How can I get more search engine traffic? – You know that the traffic is what brings more people to your site or blog. Is there anything I can do to improve my rank in Google? – On of the first questions you ask. Somebody told me they could guarantee me a spot on the front page of Google. Should I hire them? How to tell whether your niche is profitable â€” will you ever be able to rank for what you want? 8 critical optimization tricks you can start using on your own site right now. Even if you donâ€™t know anything about SEO. Even if you donâ€™t know anything about websites.